Widower Dr. Scott Grant may be a relative newcomer to Thunder Point, Oregon, but he has been in the town long enough to know that it is the place he wants to build a new life and rear his two children. Thunder Point has embraced Scott and his children. The citizens keep him busy caring for their medical needs, and they have made him a welcome and integral part of the community. Scott was still grieving over the loss of his young wife when he arrived in town, but time has brought healing and the realization that he is ready to be more than daddy to Will and Jenny, doctor to his community, and good buddy to half the town. Enter Peyton Lacoumette. Peyton never intends to become a permanent resident of Thunder Point, Curiosity brought her there after seeing an ad for a physician’s assistant while she was vacationing in the area. Peyton is looking for a new job because her boss, a charismatic Portland cardiologist, was also her lover. When their three-year relationship ended because Peyton could no longer tolerate his ineffective parenting of his three “rude, insensitive, lazy and obnoxious” kids, she needed a new home and a new job. She’s fairly sure that she will end up in a city and with a significantly higher salary than the one Scott Grant can offer, but Thunder Point and its people charm her. It has the added advantage of being only a few hours from her family’s farm. It may be just the place for her to spend a few months and get her head together. Scott and Peyton’s relationship develops slowly. They have to work their way through some misunderstandings first, and even then Scott is ever aware that Peyton plans to leave. For her part, Peyton has sworn off men with kids, until she falls in love with Will and Jenny—and their father. Just when it seems than an HEA is within sight, a family crisis has Peyton involved in her ex’s life and Scott’s insecurities threatening the love he and Peyton are just beginning to discover. I can almost guarantee that Carr fans will love her fifth Thunder point novel. Scott, as those who have read the earlier Thunder Point books will remember, is a genuinely nice guy, one of those beta heroes who manages to be steady and sweet without becoming bland and boring that Carr does so well. He’s also the kind of doctor we see too rarely in RL, one more concerned with his patients than his payment. And he is a devoted father. There are some endearing scenes between him and his children. Peyton is a strong heroine who is remarkably clear-sighted about herself and others. Readers see her personal code at work when she goes to considerable trouble to help a young woman who worked at making Peyton’s life hell for the time Peyton and the girl’s father were together. Despite her compassion, Peyton can take a tough stand when she needs to so. I particularly appreciated that she responds to problems with action rather than passive acceptance. A big part of Carr’s appeal is the verisimilitude of her settings. Thunder Point and its citizens capture readers’ hearts and imaginations, and each new book in a series allows them to return to a beloved place and revisit familiar friends. The Promise is no exception. Readers get not only a satisfying love story, but they also get to attend Devon and Spencer’s wedding, meet Sarah and Cooper’s new born, and see Al being a caring father to his foster sons. This time there is the added benefit of meeting Peyton’s large and lively Basque family. I hope to see more of them. If you are a Robyn Carr fan, all I need to say is that this is another of the winners we expect from that extraordinarily consistent author. If you are a fan of small-town romances and haven’t read Carr, you are shortchanging yourself. She is the author whose Virgin River books were a major force in building small-town romance into a subgenre. If you like characters that you want to hug and share a cup of coffee—or a glass of wine—with, this book is for you. I’ve already read Thunder Point #6, The Homecoming, my 43rd Carr novel (plus five novellas), and it too is a keeper. I wonder what 2015 has in store for Thunder Point and for Robyn Carr readers. Editor's Note: If you haven't started reading Robyn Carr's Thunder Point series yet you can download the first book in the series, THE WANDERER for only $1.99 today for Kindle or Nook. I do enjoy Ms Carr's books. Thanks for the excellent review! All I can say is: I cannot wait. I have read it. And I loved it. I think this is one if my fav Thunder Point books. Oh who am I kidding I love them all. 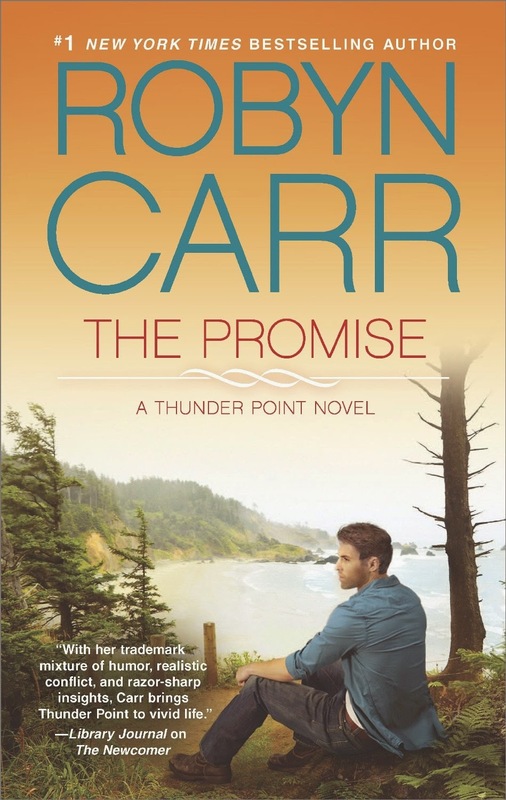 I have so enjoyed reading the Thunder Point series and am so looking forward to The Promise. I hope you will continue with the Thunder Point series for a while, Robyn! I also loved the Virgin River series. I loved the Grace Valley & Virgin River series & I am looking forward to getting started on this one.